Operating Era: 1929-1975. THIS SERIES NOW COMES WITH OUR ONE-PIECE ROOF FRAME. Atchison, Topeka & Santa Fe. The Bx-11 class was the first single sheathed design installed by Santa Fe. 2,000 cars were ordered in 1929 from 4 builders. The design was actually the 1924 ARA standard with a raised height. The spotters` detail for this class is the straight grab irons placed above the attaching bolts. The design was successful enough to warrant reorders for 3,500 cars in 1930. Differing only in the grab irons (drop grabs under the attaching bolts) they were classed Bx-12. Both classes had radial roofs. Most of the cars were rebuilt with raised peaked roofs in the 1940`s but a few ran as built into the 1970`s. About 3,200 Bx-12`s received raised roofs, some lasting to 1975 in revenue service and into the 1980`s in MOW. 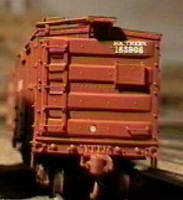 PLEASE ALSO SEE OUR #4600, #4700 & #4800 SERIES KITS.